Britain's oldest student has graduated from university aged 91- and is still planning to go on and do a PHD. Bertie Gladwin, 91, said that he had "a lot of laughs" with students less than a third of his age. Image- Maso …Bertie Gladwin left school aged 14 with no interest in academia, later going on to have an extensive career in MI6. Now the former civil servant is celebrating gaining a distinction in Masters in Intelligence History from the University of Buckingham - despite being more than 60 years older than his course mates. Rather than studying at home, Bertie packed his bag and headed into lectures and seminars with the rest of the post-grad students, who were all in their early 20s.Like any other student, the OAP turned up late for his first lecture and got lost in the maze of corridors at university. The World War Two veteran was also left baffled by computers, which he had never used before he retired in 1987, and regularly deleted whole essays by mistake. But while he struggled with some aspects of modern learning, the senior student had no problem getting to grips with his degree- having previously worked through two decades of intelligence history he studied. Bertie rose from his first job as a grocery delivery boy to become a radio communications engineer with the Foreign Office and secret service. As soon as he spotted the degree, Bertie - who still sends Morse code messages to friends across the world - knew it was perfect for him. Bertie, a resident of Milton Keynes, Bucks, admitted that he was a "late bloomer" and said that he is considering attempting a PHD. "On the first day I couldn't find the class so I was around 20 minutes late and had to creep in the back of the room,” he added. “You are never too old to learn, it's a pleasure to be able to carry on learning through your life and makes the experience all the more enjoyable. I found that my humour hadn't changed that much, even if I did seem a bit old fashioned compared to my friends we had a lot of laughs. “Going to university changed my whole attitude towards young people and I hope maybe I have shown them old people aren't too bad either”. 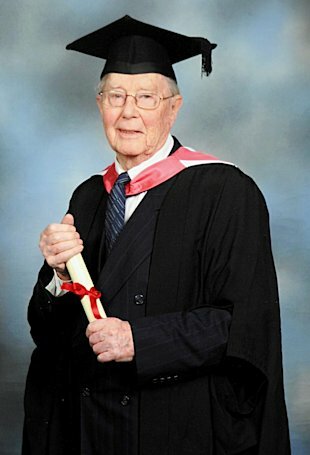 Bertie graduated in March this year - just before his birthday, aged 90 - and was proudly watched by his wife Wendy, 79, who encouraged him to try university despite not even having A-levels. Bertie completed his first degree, a BA in psychology from the Open University, in his mid sixties and followed it up with a BSc in Molecular biology which he finished in just two years, as he turned 70. Impressively, Bertie's masters is his third degree since retiring 25 years ago, after he completed a BA in Psychology and a BSc in Microbiology through the Open University. He took the British record for senior studying from the previous 89-year-old title holder. The current world record is currently held by a 96-year-old philosophy graduate from China. How inspiring! We need more people like him in this world. That is the true spirit of living --> NEVER TO OLD TO LIVE!